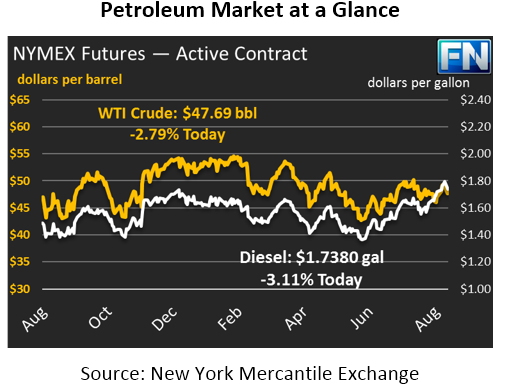 Crude prices are flat this morning after substantial losses of over $1.60 (3.3%) on Friday. Prices this morning are $47.69, just slightly above the closing price on Friday. Crude markets continue to be affected by refinery outages in the Houston area; Goldman Sachs estimates that 2.2 million barrels per day of refining capacity remain offline in Texas. Refined products are both down steeply today as Irma has reduced demand in Florida. Goldman Sachs estimates that 300 kbpd of demand will be offline in September and October due to Irma’s destruction. Fuel prices fell in unison on Friday, the first time crude, gasoline, and diesel have all moved together in quite some time. Diesel prices lost 1.79 cents on Friday, while gasoline prices fell .81 cents. Both products are extending their losses this morning – diesel prices are down 2.77 cents (-1.6%) to $1.7380, while gasoline prices are down 3.22 cents (-1.95%) to $1.6154. Irma has been downgraded to a Tropical Storm as it continues its trek through Florida. 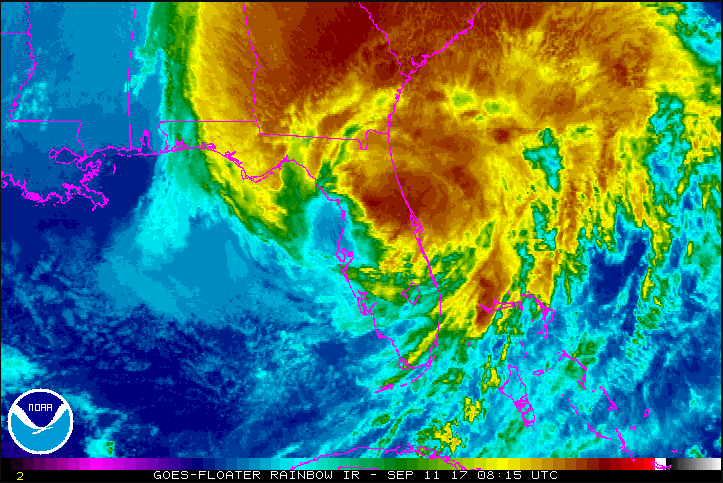 Despite weakening, the storm still has an extremely large range, bringing tropical storm force winds to the entire state of Florida and southern Georgia. The storm is expected to continue north – Atlanta, GA has declared its first ever tropical storm warning, and all of Georgia is now under a state of emergency. The NOAA shows the impacts of Irma strongest to the north of the eye, while heavy winds remain south of the eye. More updates on the storm will be sent out later today in our FUELSNews Storm Alert.